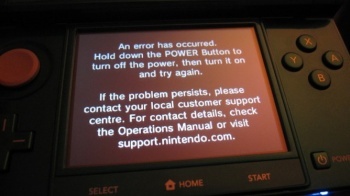 Some 3DS Units Plagued By "Black Screen of Death"
Some European gamers are experiencing a pretty irritating problem that is rendering some 3DS units inoperable. New technology launches are often plagued with glitches, and it seems that Nintendo's 3DS is no exception. While the console hasn't had any major problems, it turns out that some European gamers have started to experience an issue known as "the black screen of death." Essentially, the screen pictured here is randomly popping up for some gamers when they use their 3DSen. It's happening pretty randomly, too, as this seems to be able to happen at just about any time, including playing a single-player game, playing online, and viewing a menu. Apparently the issue is also happening with certain Mii applications. According to Geek, some users have fixed the issue by reformatting the SD card to FAT-32. Alternately, some players have been able to just reset the device and get back to playing games. Some consoles, though, have just been turned into inoperable bricks and are being returned to retailers. It seems safe to assume that it won't take Nintendo much time to identify the issue and roll out an update. Thankfully, the issue only seems to be affecting a small number of units, though it's a little weird that this issue has only popped up during the European launch (it hasn't been reported in Japan or North America).